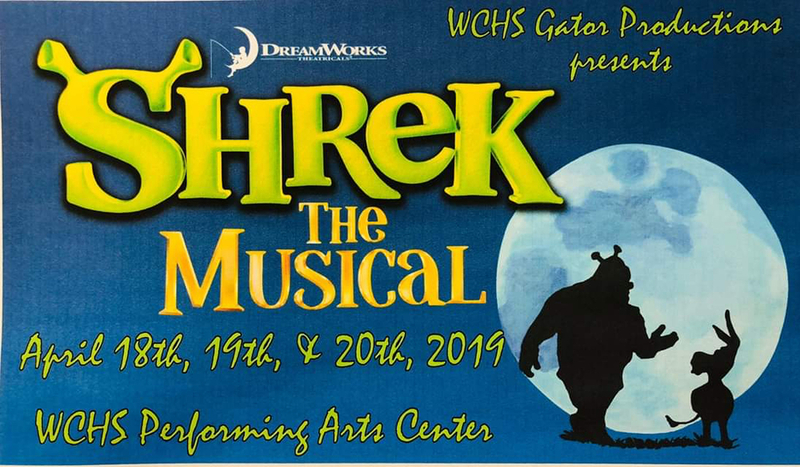 Mark your calendar to come see WCHS Gator Productions presents "SHREK The Musical". Come out and see SHREK and friends performing from the swamp to the land of Duloc! Concessions available. We’ll have popcorn, flowers for your favorite cast/crew member, "Shreklaces" (glow in the dark necklaces), raffle for a patio set with umbrella, and free pictures with the cast after the show. (Bring your cellphone!) The whole family is welcome!! Showtimes are April 18th, 19th & 20th at 7pm with a matinee on Sat, April 20th at 2pm. Tickets are $10 at the door, and 3 and under free!